Cut the pineapple into thick slices or if you want you can cut into roundels. Roast them in open flame, till they get slightly roasted. If you have the bbq you can in that too. Also you put can put a grill on the stove and place the pineapple on that grill and roast it. Roast the capsicum also and keep it aside. Chop the grilled pineapple , capsicum and onions finely. De seed the tomato and de seed the green chili. Chop the tomato, green chili and coriander leaves finely. 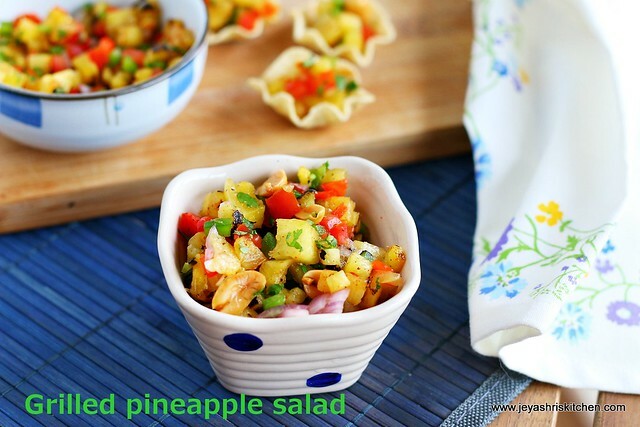 In a bowl combine the pineapple, onion and capsicum. Add salt and red chili powder. Add the chopped tomato, green chili and coriander leaves. Mix well. Add peanuts if you want and toss well. 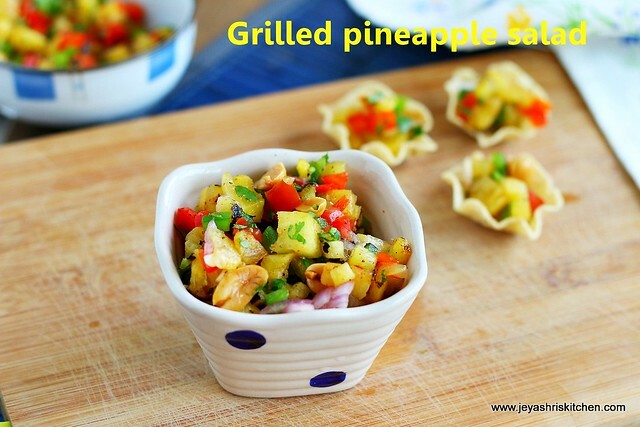 Grilled pineapple salad is ready to serve. You can serve this a s a salsa with tortillas too. You can add cooked red kidney bean(rajma) to the salad to make the salad more filling. Even cooked pasta or cooked corn kernels can be added. You can roast the green chili and chop them finely and add to the salad. Few tblsp of thick yogurt can be added to this salad as a dressing. If you want your salad to be crunchy you can add some chopped lettuce to it before serving. You can add 1/4 tsp of soya sauce to the salad. Sooper good salad with Pineapple Jeyashri.... Will it taste good by noon if we pack it early in the morning??? ?